Welcome to Drackenberg's Cigar Bar. Jackson and his friendly staff invite you to join them at Drackenberg's. 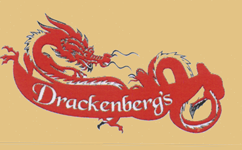 Conveniently located on Madison's near north side, Drackenberg's is home of a large selection of fine cigars and a wide assortment of domestic, imported, (and exotic) wines, beers, and liquors. Drackenberg's is an "island in the smoking ban" where you may enjoy your favorite cigar or pipe - in indoor comfort - while talking with friends and enjoying your favorite adult beverage.